I am working on an android app that requires the detection of vertical motion. 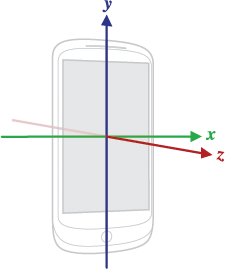 When moving the tablet upward, the Gyroscope, Accelerometer, and Linear Acceleration sensors give a corresponding value indicating upward or downward motion. The problem I have is that these sensors will also read an upward/downward motion when you tilt the tablet towards the user or away from the user. For example, the x value in the gyroscope represents the vertical plane. But when you tilt the device forwards, the x value will change. When I make this motion, the same sensor that reads vertical motion reads a value for this. The same goes for the rest of the sensors. I have tried to use orientation coupled with the gyro to make the conditional statement, if the pitch is not changing, but the x variable is going up/down, then we have vertical motion. The problem with this is that if the user moves it up but tilted slightly, it will no longer work. I also tried making it so if there is a change in tilt, then there is no vertical motion. But it iterates so quickly that there may be a change in tilt for 1/100 of a second, but for the next there isn't. Is there any way I can read only vertical changes and not changes in the devices pitch? "Please come up with a mathematically sound definition of what you consider 'moving upwards.'" 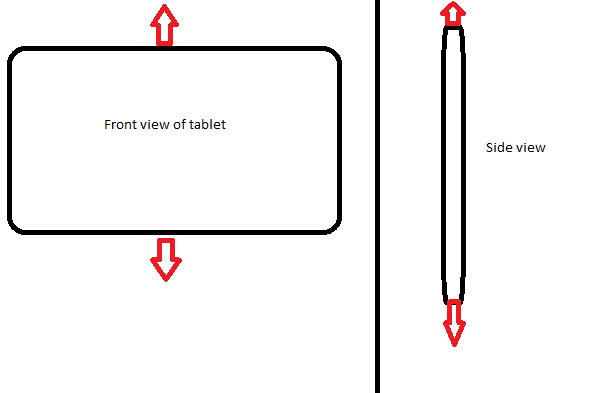 This was my initial question, how can I write a function to define when the tablet is moving upwards or downwards? I consider a vertical translation moving upwards. Now how do I detect this? I simply do not know where to begin, thank you. Ok, even though this question is fairly old, I see a lot of confusion in the present answer and comments, so in case anyone finds this, I intend to clear a few things up. First of all, the gyroscope does not measure vertical motion as per your definition (a translatory motion). It measures rotation around each of the axes, which are defined as in the figure below. Thus having you tilt your device forwards and backwards indeed rotates it around the x axis and therefore you will see non-zero values in the x value of your gyroscope sensor. the x value in the gyroscope represents the vertical plane. I'm not sure what is meant by "the vertical plane", however the x value certainly does not represent the plane itself nor the orientation of the device within the plane. The x value of the gyroscope sensor represents the current angular velocity of the device around the x axis (eg. the change in rotation). But when you tilt the device forwards, the x value will change. When I make this motion, the same sensor that reads vertical motion reads a value for this. Not quite sure what you're referring to here. "The same sensor that reads vertical motion" I assume is the gyroscope, but as previously said, it does not read vertical motion. It does exactly what it says on the tin. This is more in response to user Ali's answer than the original question, but it remains relevant in either case. The individual outputs of the linear acceleration sensor (or any other sensor for that matter) are expressed in the coordinate system of the device, as shown in the image above. This means if you rotate the device slightly, the outputs will no longer be parallel to any world axis they coincided with before. As such, you will either have to enforce that the device is in a particular orientation for your application, or take the new orientation into account. The ROTATION_VECTOR sensor, combined with quaternion math or the getRotationMatrixFromVector() method, is one way to translate your measurements from device coordinates to world coordinates. There are other ways to achieve the same goal, but once achieved, the way you hold your device won't matter for measuring vertical motion. In either case, the axis you're looking for is the y axis, not the z axis. You mentioned some problems regarding noise and update rates in the question, so I'll just mention it here. The simplest and one of the more common ways to get nice, consistent data from something that varies very often is to use a low-pass filter. What type of filter is best depends on the application, but I find that a exponential moving average filter is viable in most cases. Note that if you take proper care of the orientation, your transformed linear acceleration output will be a good approximation of vertical motion (well, change in motion) without filtering any noise. Also, if you want to measure vertical "motion", as in velocity, you need to integrate the accelerometer output. For various reasons, this doesn't really turn out too well in most cases, although it is less severe in the case of velocity rather than trying to measure position. OK, I suspect it is only a partial answer. For some reason you are concerned with the device orientation as well, and I have no idea why. I suspect that you want to detect something else. So please tell us more and then I will improve my answer. I read the post on coremotion, and you mentioned that higher z lower x and y means vertical motion, can you elaborate? If rel_z > 0.9 then the acceleration towards the z direction dominates (vertical motion). Note that the constant 0.9 is arbitrary and may require tweaking (should be a positive number less than 1). The 1.0e-6 is there to avoid accidental division by zero. You may have to add another constraint that z is sufficiently large. I don't know your device, whether it measures gravity as 1 or 9.81. I assume it measures it as 1. Again, the constant 0.1 is arbitrary and may require tweaking. It should be positive. 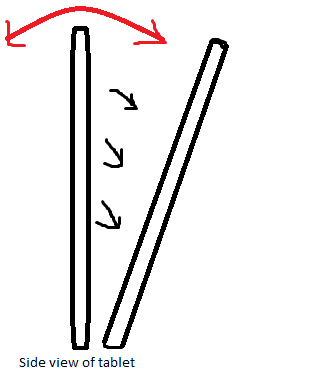 It is moving upwards: The center of mass is moving upwards. My code has the correct behavior. Please come up with a mathematically sound definition of what you consider "moving upwards." Not the answer you're looking for? Browse other questions tagged android accelerometer gyroscope motion tilt or ask your own question. Is it possible to detect vertical movement (only up and down) with Android Sensors? how to detect if device is pointing in a certain direction?